Brenda Nguyen, 27, started @wanderingbostoneater three years ago, after graduating from college in Boston and starting work at a nearby pharmaceutical company. 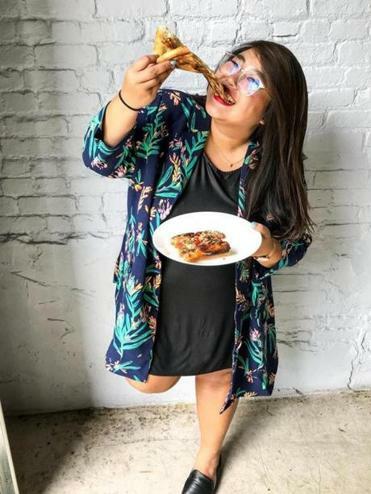 “Hey, I’m employed, that’s fantastic,” she recalls thinking, “But what do I want to do that’s going to be more fulfilling in terms of my interests?” Nguyen combined her lifelong interest in writing with a love for food and travel to create her Instagram, which now boasts over 23,000 followers. Nguyen spoke with the Globe about being passionate about her work with food, travel, and the pharmaceutical industry. Q. How did you get started on this? A. I wanted to get back to the fact that I want to connect with people, and breaking bread with people was something that was always very important for me, and building a community of people together. And I figured I had an archive of food photos because I’d always been documenting everything because of my need and want to just write about things. And people were always asking me like, hey, where’s the best place to go eat for a date, or for my parents, or a special occasion? So that’s how I started to head forward with the goal of writing, and I knew that for people to want to read what I have to say, I have to build an audience. But it’s not as easy as just like starting a blog and just being like, all right, read my stuff. So I recognized that Instagram was a platform that was really up-and-coming. And people really like that instantaneous picturesque vision. And I consider myself as a storyteller but I also do love photography a lot, too. So that’s why I consider myself more of a visual storyteller. So I started building my audience and my feed. And then I started traveling as well just more in my personal life. And I figured like, hey, you know, I’m just gonna start documenting my adventures. And I tell my friends that I travel one bite at a time because I plan my itineraries when traveling by where am I going to be eating, so that’s kind of how I integrated both food and travel into the way I connect with people. Q. How much of what you do is local and how much is travel? A. It’s mostly local, Boston, and then occasionally it’ll be like, the weekend trips or the extended trip. I actually just came back from an extended trip yesterday. I was doing, like, a 10-day Euro trip, and then last month I did like a weekend trip to like Paris or something like that too, or I was in New York and stuff like how to make it like attainable for people where Boston is my home base but it’s not unrealistic to just like kind of go away for a weekend. Q. If someone wasn’t local and came to Boston, what would be your quintessential recommendations in terms of good food and also the experience of eating here? A. Alcove just opened up last month and I’ve been going there a lot. The drinks are fantastic, The food is great, and just the overall feeling of hospitality is there, like the team just gets it there. They really value just making sure everyone feels like they’re accommodated and that if they’re repeat patrons, then they are recognized for whichever drink that they had previously, or whichever dish that they ordered previously. So that’s definitely been one on my list. Another that has been near and dear to my heart since I started even exploring the Boston dining scene is Eastern Standard. That is one I’ve been frequenting since my college days. Q. You said you were involved in pharmaceuticals. Do you see a future in doing this food-travel full time? A. I get this question a lot, actually. And honestly, I don’t see why I have to choose. I would like to continue doing both as much as I can, and to the best of my ability, because I’m very passionate about both of them. I’m very passionate about, you know, food and traveling and sharing my experiences. But I’m also passionate about working in a pharmaceutical company and how I can have an impact. I work in supply chain full time, so in a way I actually learn a lot about the operation behind food and I parallel it to operations in the pharmaceutical company, and vice versa. I don’t want to choose because I still want to learn about the aspects I’m interested in, in terms of food-traveling, and how it brings communities together, but also how to create a more sustainable process in terms of the blogging world and the business world in general and how to communicate about that. Interview was edited and condensed. Lillian Brown can be reached at lillian.brown@globe.com. Follow her on Twitter @lilliangbrown.